Fast Times plays the top dance hits of the 80s, the ultimate decade of decadence. From A-Ha to The Cure, from Madonna to Young MC, every song is an instantly recognizable 80s hit guaranteed to get audiences on their feet and dancing. From new wave and synth-pop to arena rock and hair metal, Fast Times plays every song entirely live, with a dance beat that you cannot resist. 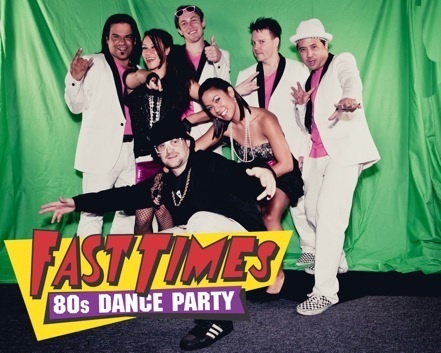 Currently in its 13th year, Fast Times has performed the high-energy hits at numerous venues including AT&T Park, Great American Music Hall, Slims, Red Devil Lounge, Pier 39s Fleet Week Celebration and the 2010 PGA Tour Stonebrae Classic. Fast Times has performed for companies of all sizes, from start-ups to Fortune 500s. Fast Times has performed at many private events including wedding receptions, charitable fundraisers, birthday celebrations and class reunions. If your function is a formal event, Fast Times can offer appropriate stage attire as well as 80s rock star fashion which is always a huge hit with audiences. Fast Times‚Äò high-energy stage show, power-packed song list, fun-filled audience participation and 80s fashion and flair make Fast Times the dance band to book for your next event!